First deal was at Topshop! I usually don't shop at Topshop because some of the style doesn't really suit me OTL but I found this pretty chic sweater (?) for only $25! A lot of stuff was sold for 50% off and since it's a perfect colour and design for autumn, I thought, why not?! Next I went to Myer. I went to their Miss Shop section and bought a super cute striped dress~ It's from the Quirky Circus range by Minkpink. I also went to the Benefit counter. Benefit's a brand I've been coveting for ages so I thought I might as well go nab a few deals! I bought the Passport to Posh kit, which is basically for your eyes. It includes Bad Gal Lash mascara, three powder shadows (highlight, accent, crease), two brushes, creaseless cream shadow/liner, Boi-ing and Eye Bright. They're all in sample-ish sizes, but it's a great way to try out several products at once and see which is the best for you! I also impulsively bought a Radiant Skincare set. I'm not sure how much it was originally (bad girl, Amy!!!) but it was only $24 so I thought, why not?! It includes face wash, face polish, eye cream and three different types of moisturiser. <3 The bottles are soo cute too! There are so many products I keep putting off reviewing. ; ^ ; I'm in the process of writing three reviews which will be scheduled so look forward to that! And a few important tutorials too > A < Bear with me, everyone! I follow you! I hope you follow me!! 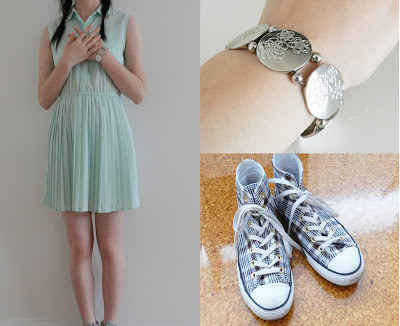 I love the mint green dress! Following you now, maybe you would like to follow back? nice stuff! Of course we can follow each other! Followed you on bloglovin! Now following your blog, if you follow back, that is so great for me.